The evolution of my creative interests has been a long and positive process. Over the years, I have been fortunate to have worked with exceptional teachers and mentors, and have had multifaceted educational, employment, and travel experiences — all of which have enriched my artistic journey. My formal training — honed at the University of Toronto’s School of Architecture, the Academy of Merchandising and Design, and Ryerson University — have all fueled my interest in exploring not only the links between form, colour, and texture, but also the ways in which I can further my ability to translate an artistic concept into a visual language designed to evoke a response in the viewer. More specifically, I was fascinated by the lectures that chronicled the progression of artistic form in human history. As a result, my eyes were opened to the manner in which art and design have shaped our world. With this “art-centric” view, I continued to explore my creative nature by working for many years as a Graphic Artist at one of Toronto’s daily newspapers. The power of that business to change ideas and images has long been recognized, and my employment there together with my computer skills has added broader and deeper dimensions to my traditional artistic offerings. Currently, my interest in movement and energy is expressed by the use of paint, lacquer, epoxy, and multi-textured materials. In addition, I use the “drip painting” technique to visually capture dynamic concepts. By applying multiple layers of colourful paint, I am able to produce a sculpted feel that adds a sense of depth to my compositions. Some of my latest paintings combine ChromaDepth 3D glasses and traditional colour theory to generate vibrant creations with dramatic illusions of depth. Other paintings add digital displays as part of the composition. By drawing on the tension between organic and man-made environments, the use of the “drip” technique allows me to impose order on natural forces and, thus, transform the banal into the beautiful. In essence, my formal training, diverse work experience, and rich cultural heritage from Ecuador serve as the underpinnings of my current exploration of ways to blend traditional art media and techniques with 21st century technologies. 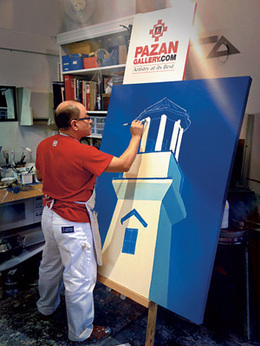 Pazan in his studio painting.